A two-day celebration of artists and makers breathing new life into old styles, crafts and traditions. 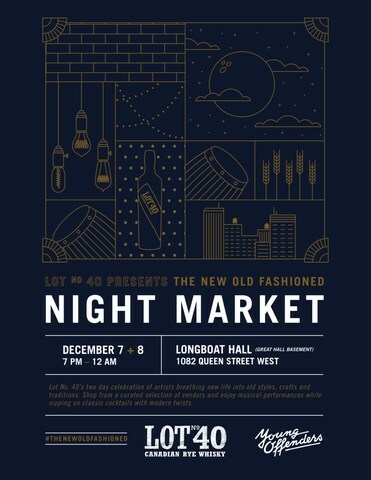 TORONTO, Dec. 4, 2018 /CNW/ - Lot No.40 Canadian whisky is thrilled to launch The New Old Fashioned Night Market series, celebrating the re-invention and discovery of classic artforms by local artists. The project will feature digital content, highlighting artists who put "new twists on classics", and is underpinned by a two-night event that will be held on December 7th and 8th at Longboat Hall in Toronto. The night market event will debut four new Lot No. 40 Old Fashioned cocktail recipes inspired by the feature artists' work and interests. The evening will also include one-of-a-kind installations by Hatecopy and Castor Design, a curated selection of local vendors, visuals by Laura-Lynn Petrick, and live entertainment by emerging musical artists, including Dwayne Gretzky. Lot No. 40, a 100% Canadian rye expertly distilled and crafted from the same practices many generations ago, takes pride in celebrating traditions while bringing them into present day. In collaboration with the creative team at Young Offenders, Lot No. 40 is proud to offer an immersive experience of local artists that show the same spirit of revitalizing old styles, crafts and traditions. "Lot No. 40 has grown from a family recipe to the whisky we know and love today. As a brand that has re-invented itself overtime, we feel that this platform is a great showcase for our appreciation of artists that are also continuously refining their art, while breathing new life into old forms." says Chris Bhowmik, Brand Director Canadian Whisky & Gin, Corby Spirit and Wine. "It's a true a pleasure collaborating with Lot 40 and inspiring to work with their artists," says Laura-Lynn Petrick, director, photographer and videographer. 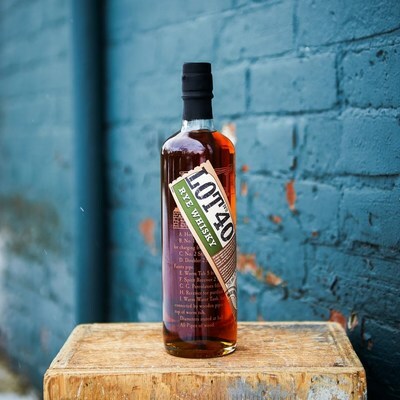 "Lot 40 whisky is timeless yet innovative, qualities I appreciate, in life and in art. They're bringing exciting new elements to whisky while respecting its traditions." The two-day Toronto event will be the first of The Old Fashioned Night Market series before heading into other Canadian cities. Lot No. 40 is currently looking to partner with local vendors and artists across the country. Admission is free. Must be legal drinking age to attend. Corby Spirit and Wine Limited is a leading Canadian marketer and distributor of spirits and imported wines. Corby's portfolio of owned-brands includes some of the most renowned brands in Canada, including J.P. Wiser's®, Lot No. 40®, Pike Creek®, and Gooderham & Worts® Canadian whiskies as well as Lamb's® rum, Polar Ice® vodka, McGuinness® liqueurs, and Ungava® gin. Through its affiliation with Pernod Ricard S.A., a global leader in the spirits and wine industry, Corby also represents leading international brands such as ABSOLUT® vodka, Chivas Regal®, Aberlour® and The Glenlivet® Scotch whiskies, Jameson® Irish whiskey, Beefeater® gin, Malibu® rum, Kahlúa® liqueur, Mumm® champagne, and Jacob's Creek®, Stoneleigh®, Campo Viejo®, and Kenwood® wines. In 2018, Corby was named one of the 50 Best Workplaces in Canada by The Great Place to Work® Institute Canada for the seventh consecutive year. Corby is a publicly traded company based in Toronto, Ontario, and listed on the Toronto Stock Exchange under the trading symbols CSW.A and CSW.B. For further information, please visit our website or follow us on LinkedIn, Twitter (@CorbySW) and Instagram (@CorbySW).